Family owned and operated since 1978, Vulcan Global Manufacturing Solutions, Inc. leads the market in radiation shielding solutions for the medical, security and NDT industries. 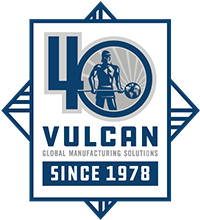 A custom manufacturing company, we design and produce innovative finished products and assemblies from our four business units: Vulcan Lead, Vulcan Machining, Vulcan Fabrication and Vulcan China. Vulcan GMS is an entrepreneurial organization that looks for solutions to our customers’ challenges. We focus on new processes and solutions, equipment, and capabilities to meet the growing needs of our customer base. We are proud of the growth and expansion that has allowed us to provide great diversity to our customers, while expanding our manufacturing capabilities and adding value. It’s what a market leader does. Vulcan GMS supports many markets, including some of the most demanding on the planet. Review the markets we serve and ask us how we can help serve yours. Our material variety is unmatched. Click here for a list of commonly used materials. Like any great company, Vulcan keeps a set of core values that make us different from the rest. See what separates Vulcan from all others. At Vulcan GMS, the safety of our employees, our work place and our environment is paramount. Vulcan GMS has been a proud sponsor of the USA Luge team for more than 30 years. In 40 years, we’ve learned a lot. When other suppliers dropped out and left their users stranded, we put your needs front and center. Structuring our business for longevity and total solutions.